Sharing ideas and inspiration in today’s green energy frontier was the goal of the Canadian Wind Energy Association’s (CanWEA) Connections event, held in Edmonton, Alberta on Tuesday, April 11 at the city’s Matrix Hotel. Industry leaders and decision-makers came together to share ideas and make connections on Alberta’s exciting green energy future, capped off by an address by provincial energy minister The Honourable Margaret McCuaig-Boyd, who outlined the Alberta government’s plans for moving the province forward into tomorrow’s energy landscape. Representatives and MLAs from the Alberta NDP, Liberal, Progressive Conservative and Wildrose parties all attended the event, as did several CanWEA members and others interested in Alberta’s wind energy industry. 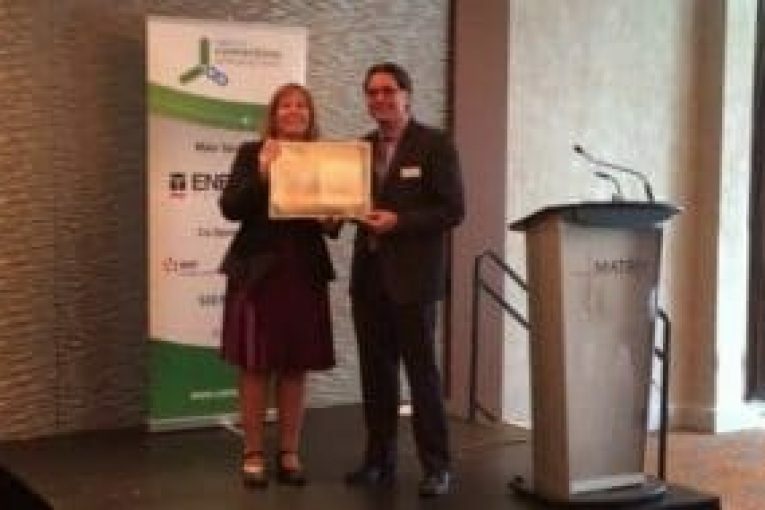 As well, Minister McCuaig-Boyd was presented with CanWEA’s 2017 Group Leadership Award on behalf of her government, recognizing their efforts in advancing renewable energy in the province. Big things are afoot for Alberta’s renewables sector. With the provincial government planning to support an additional 5,000 MW of renewable capacity and working to meet an ambitious goal of 30 per cent of electricity generation coming from renewable energy by 2030, Alberta has become a primary focus for new wind energy development in Canada. This spring, Alberta’s Renewable Electricity Program will initiate its first procurement of 400 MW. With so many exciting developments in the world of renewable energy in Canada, Alberta is becoming the province to watch. Investment in renewable energy will diversify both Alberta’s economy and electricity supply, while leading to the much-needed creation of jobs in clean technologies – not only across the province but also in the communities hosting these projects. Local wind development has proven to provide significant economic benefits to both landowners through land lease payments and to municipal governments through property tax payments – definitely a win-win scenario. Wind energy also provides Albertans a rare and exciting opportunity to become direct contributors to the province’s electricity supply through participation in proposed small-scale community generation programs. Moreover, increased wind energy generation will improve the overall health of all Albertans by reducing harmful pollutants and improving our air quality by helping to facilitate the province’s proposed shut-down of coal plants by 2030. Alberta’s Climate Leadership Plan represents a tremendous opportunity, and heralds a significant increase in the production of clean, affordable and reliable wind energy in the province. It’s only through leadership at all levels of government, combined with an innovative and bold industry, that Alberta can continue to blaze trails towards being a true beacon of change in Canada. Photo: CanWEA President, Robert Hornung presents Minister McCuaig-Boyd with CanWEA’s 2017 Group Leadership Award at the Connections event, held in Edmonton, Alberta on Tuesday, April 11.